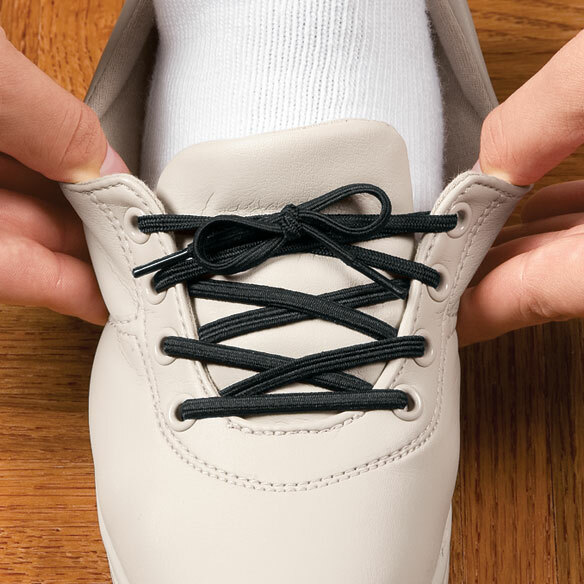 Elastic shoe laces stretch from 24" to 58" so shoes slip on and off—no bending or untying required! 3 pairs of flat elastic shoe laces tie securely. 90% polyester/10% spandex. Imported. I can no longer reach my feet to tie my shoes. I had back surgery that limits what I can do. These elastic shoe laces will be a great help with my walking shoes that I have that need tying. I can replace the regular laces with the elastic and should be a lot easier getting my shoes on, as I can keep this laces tied at all times. Due to fractured hip these are wondrous. Don't have to tie or untie. Just slip them on. It is perfect for any shoe. It was gift to my mother. I bought the shoe laces for my elderly mother who has a hard time with shoe laces and this was the best choice I have ever made. So easy for her!!! Stretchable too!!! They are idea for the person that wants to lace up your shoes and just slip them on. I use the elastic shoe laces to enable me to slip my shoes on instead of bending over to tie them. I can't bend over that far due to arthritis. This helps me be more independent instead of asking my husband for help. Gardening for three hours every day for a week, I finally ordered elastic shoe laces because my normal shoe laces kept untying. And my hands were too dirty to retie them. I got tired of walking around with my shoelaces dragging behind me. These elastic ones don't come loose, if I tie them tight enough, AND I can pull on my shoes and take them off without touching the laces. Mornings are the worst for arthritic pain but I still needed to wear shoes. These laces made me able to wear athletic shoes and I don't need to tie them everytime. Makes tying shoes obsolete. I am using them for casual shoes and have recommended them to a friend. Ideal for those who have trouble bending to tie shoes. I have arthritis so bending over to tie shoes is difficult. Now I can just slip into my shoes. Perfect for us who have to wear an in-shoes brace. You can only get white in the stores and 1 pair for what I paid for 3 pair. I knew these weren't going to be the "be all-end all of shoelaces. I got one long pair and two shorter pair. You can double the length of the short ones, or make a REALLY long one by sewing or tying them together.I laced up 2 pair of NB running shoes with the 1 long 2 short method. excess lace at the end Tie a knot, snip and melt a new aglet. No worries. These are great. Flexible support for when I have to spend a lot of time standing or walking; but relaxing enough to not be restrictive when I spend long periods sitting or driving. Easy to put on shoes without having to lift foot or bend over to tie. No more irritating arthritic hands to tie shoes. I bought both colors, black and white. Shoes are so much easier to put on. Don't even have to untie. This helpful if you have had hip surgery. Once on your shoes, just slip your feet in as you won't be taking time to tie your shoes again. I like these because the laces that come with the shoes are always too long. This is the second time I have ordered these. Great product, you will love them. This was a birthday gift. The recipient loves them. She said they are superior to previous elastic laces she has had. BOUGHT FOR ELDERLY PARENTS. THEY LOVE NOT HAVING TO TIE SNEAKERS. The shoe laces are extremely helpful. Due to nerve damage to my foot during hip replacement surgery, I have to wear a brace. The shoe laces allow me to put on my shoes without any help. The greatest advantage is it only takes one hand to put you shoes on. that is good for my daughter who was handicapped in a car wreck at 16 and lost the use of her left arm. Love these for my back. I haven't been able to tie my shoes for a long time. Then I found these laces and now I am back in all my shoes again. The shoestrings make it easier for me to place shoes on my feet. I have pain so I dont like to bend or pull on shoes. They are for shoes with 4 holes as pictured. Would be great if they made longer ones for 6 holes. These shoelaces were perfect for my grandson. He struggled getting his shoes on/off. With the help of the laces he can now just slide his foot into the shoe. If I had any improvements to make, I would make the laces longer. They don't give much room to tie the bow when you use them on atletic shoes. Like this product, will buy more. 80 year old friend has trouble tying shoes. He wears high top tennis shoes to support ankle. These laces are too short. Will try them on other shoes. May work. Seem sturdy and well made but are much to short to fit in adult women's shoes. Everything stated in the product description is essentially true, but the laces could be half again longer in the unstretched state. Still not a bad product, simply one which could be better. Would probably serve well with children's shoes, but not quite long enough for adult sizes. PRO: Look like regular shoelaces. CON: They are too short for my Step-Dad's shoes (can't tie a bow at the end, just a knot). My husband has trouble tying his shoe laces. I bought these for his shoes. Then may fit a women's shoe but not a mans. Waste of money. Too short. These laces were too short and too thin for the sneakers I wear. I should have looked closer at the picture before making this purchase. The laces will not fit an athletic shoe too short, and they don't look real great they are too narrow. I do not reccommend them. Not long enough for my shoes. I like elastic shoe laces - what I received is what I already had - laces too short. I have other ones that were 30" and perfect but are in white and brown, I needed black. Laces were too short did not fit the sneakers. Couldn't use them at all, waste of money. These are only 23-1/2" long. They won't fit on adult shoes because they are so short. You can't even lace up the entire shoe. I bought these for my mom who has arthritis but they are too short for her tennis shoes. If they won't fit her shoes, they're sure not going to fit mine either. Wish I hadn't ordered 2 sets. These elastic shoelaces were advertised for seniors. I found I could not stretch the shoe enough to get my foot into it when using the shoelaces. Great idea but did not work for me. Hopefully I will be able to put my own shoes on without relying on someone to tie them for me. My second order. Used to help me put on my shoes after back operation. To help my husband who has Parkinson's and has trouble with tying shoe laces. I hope these will help me with my sneakers. So that I don't have to untie my shoes to put them on. My son has cerebral palsy and it is hard for him to tie his shoes. I thought it would be easier to not have to tie and untie all the time. Ease of putting shoes on and taking them off. I have trouble tying my shoes due to hip surgery and problem legs. I have trouble keeping my shoelaces tied. father-in-law cannot tie shoes any more. this may help him use his shoe wardrobe and be able to dress himself. Do I ever need them! Osteoarthritis plus carpal tunnel syndrome---ouch ouch and ouch, and I can't get a good grip. These should help. easy delivery for 85 year old without a car. I had previously purchased elastic shoe laces from you.and liked them. my shoes have 6 eye lets per side will these work ok? BEST ANSWER: My feet are very wide and I have 5 eyelets on each side, so I would say it depends on the width of your feet. I like my laces loose and have no problem tying them. My shoes have 5 eye lets and there does seem to be enough room for six. For me it is just a guess. Good Luck. Do elastic shoelaces come in packs of two? BEST ANSWER: Thank you for your question. It fits a four eyelet shoe. We hope this information will be of help to you. what is the exact length of the shoelaces? BEST ANSWER: Thank you for your question. The shoe laces stretch from 24" to 58". We hope this information will be of help to you. How long are these laces? BEST ANSWER: Thank you for your question. The laces are 24" long before they are stretched and can stretch up to 58". We hope this information will be of help to you.